CONGRATULATIONS to new brother knights Tom Kramer (left) and Tony Miner, who took their Initiation Degree at St. Pius Fr. Baden Council 4263. Be sure to congratulation them and welcome them to our council when you see them! 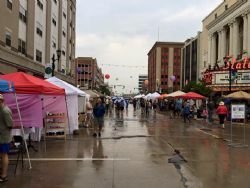 Bad weather wasn't enough to put a damper on South Bend's Art Beat celebration in downtown South Bend. Steve Sommers once again proved our pierogis were a hit, and we thank him and others who supported this effort for making it a success! Congratulations to new council member Justin Hintz, who took his first degree on July 27 before our scheduled social meeting. Please make sure to introduce yourself to Justin as you see him at meetings and council events. CONGRATULATIONS to members of Santa Maria Council 553 who advanced in the 2nd and 3rd degrees at Council 1043 in Elkhart on Sunday, July 26th. 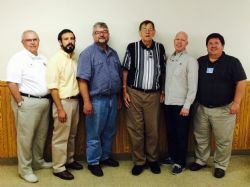 Pictured are (l to r): District Deputy Rick Alexander, Lecturer Liam De Los Reyes, Thomas Golubski, Richard Berger, Jerome Kleber and Grand Knight Scott Gring. Santa Maria Knights again had the honor of supporting the Chris Godfrey Football Challenge, a one-day free football camp run by former NFL'er Chris Godfrey - President of Life Athletes and also a brother knight of Council 553. 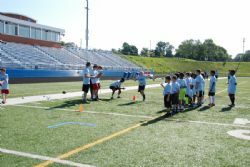 The football camp, in addition to teaching football fundamentals to kids in grades 3 thru 9, instills good sportsmanship and positive life choices. Council 553 participated by providing breakfast/snack bars to the 125 kids participating in the camp. For the eith year Council 553 has welcomed the young men of Pi Kappa Phi fraternity participating in the Ability Experience Journey of Hope (formerly Push America Journey of Hope) to a spaghetti dinner at the council hall. This is a cross-country bicycle trek to raise money and awareness for people with disabilities. Comprised of three 35-member teams from Pi Kappa Phi, these men average 75 miles a day from the west coast to Washington, D.C., stopping in communities along the way to participate in events - such as puppet shows, wheelchair basketball games and dances - aimed to educate people about the abilities of people with disabilities. Council members prepared and served the dinner to the 35 cyclists and handlers during their stop-over in South Bend. Mass Mob VII at St. Monica Church, Mishawaka on July 11, 2015 was an impressive showing. 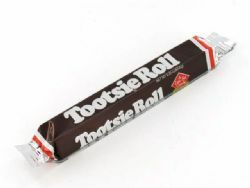 According to Msgr. Bruce Piechocki, the Mass is usally attended by 120 parishioners. This afternoon there were over 240! 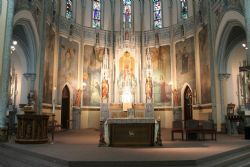 Once again South Bend Mass Mob, under the organization of Santa Maria Council 553, brings attention and financial support to a Michiana parish. 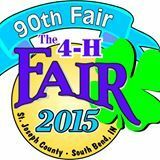 Once again Knights of Santa Maria Council 553 answered the call to support important organizations presenting at the St. Joseph County Fair. Knights helped fill out the schedule for the Legion of Mary booth under the guidance of Brother Rick Becker, and Knights also participated in the St. Joseph County Right to Life booth. Thanks to all who came out and gave their time! The first meeting of the month was a little more than most bargained for as some last-minute scheduling allowed us to bring in four new members. Participating in the First Degree were Jerry Kleber, Michael Kramer, Kristian Engelsen and Charles Ingram, Jr.
During the weekend of May 23, 2015 - and including the three weekdays leading up the weekend, members of Santa Maria Council 553 organized, set up, prepared and sold pierogis and Polish sausage as part of the South Bend 150th Birthday "Taste of Michiana." 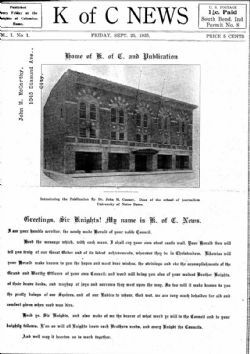 Brother knights and ladies worked tirelessly to promote our enthusiasm as a fraternal organization and our long history in South Bend dating back to 1901. This was a landmark event both from a fundraising endeavor and a social one. Many members and wives participated who had never participated in council functions before. 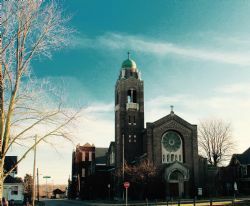 Graduations, parties and fantastic early summer weather didn't put a damper on Mass Mob VI as mobsters gathered for the 4:30 p.m. Saturday Vigil Mass at St. Adalbert Church on May 16, 2015. On May 16, 2015, Santa Maria Council 553 partnered with the Project Search Program in South Bend by making available the use of the council hall and preparing a spaghetti dinner for the organization to use as a fund raiser. Project Search is operated by South Bend Community Schools and the ADEC Program, and is designed to help high school students with physical and intellectual disabilities transition into meaningful employment with the assistance and while under the supervision of the Project Search organization. As a result of the joint effort, Project Search raised over $900, which they will use to purchase lunch box items in the near term, and fund future projects later in the year. TO show their appreciation, Project Search participants have volunteered to come to the council hall and clean the tables and chairs. On May 9, 2015, Knights of Columbus Council 553 Santa Maria conducted their second Campaign for Intellectually Disabled Children at the South Bend Farmer's Market to raise money for Indiana Special Olympics. In five hours council members raised $910 for this wonderful program. Great food, music and dancing were the product of months of hard work by chair-couple K.C. and Toni Pocius when the 50th Annual Lourdes Charity Ball was held on May 2, 2015 at Santa Maria Council 553. 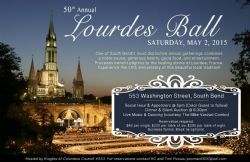 A wonderful time was had by all while raising funds to help provide a pilgrimage to Lourdes, France for a needy soul. 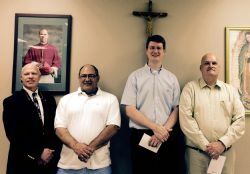 The week of April 28 through May 1 was an exciting time around the grounds of Little Flower Parish on Ironwood Dr. South Bend's very own Redeemer Radio station was having it's first-ever Share-a-thon to raise money to support operations. Several knights of Santa Maria Council 553 assisted with the endeavor by serving as greeters and bringing ice and refreshments to the new studio. At a ceremony held at the University of Notre Dame, Supreme Knight Carl A. Anderson and the Knights of Columbus were honored with the annual Evangelium Vitae Medal, one of the nation’s most prestigious pro-life awards. 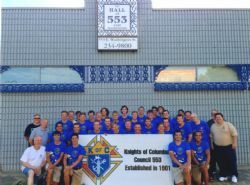 Click HERE for the full story on the Knights of Columbus Supreme website. Click HERE to see pictures from Supreme. You may see some people you know! 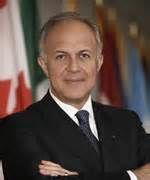 Click HERE to hear Supreme Knight Carl Anderson's dinner remarks from the Indiana Knights of Columbus State Convention, April 25, 2015. 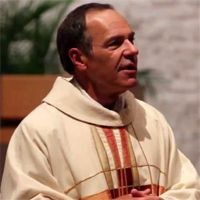 Click HERE to hear Indiana State Chaplain Fr. Ted Rothrock's dinner remarks from the Indiana Knights of Columbus State Convention, April 25, 2015. 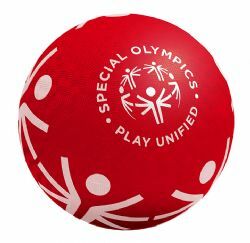 Brother Rick Podrasky enthusiastically accepted the position of Special Olympics Ambassador to the Indiana Special Olympics. With so much going on between the state councils and this wonderful organization, Council 553 needed the right man for the job, and Rick will be instrumental in promoting our involvement and support to the year-round mission of ISO. SK Bob Zielinski hosted the weekly installment of KnightLife on Redeemer Radio, with Knights of Santa Maria Council 553 sharing insights, history and reflection on the amazing growth of the Mass Mob Movement in our diocese. CLICK HERE to listen to the recorded show. Truly HE is risen, Alleluia! 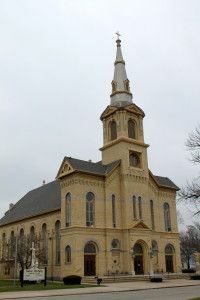 Divine Mercy Sunday was the setting for Mass Mob V at St. Casimir Church on April 11, 2015. 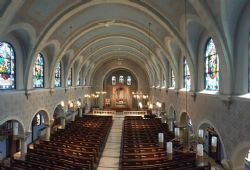 Father Peter Pacini welcomed all in attendance and pointed out South Bend's "hidden gem" that is the beauty of St. Casimir Church. 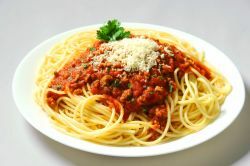 A spaghetti dinner once more prepared by Steve Sommers and Council 553 was served in the adjacent school gymnasium, a historic treasure in itself. 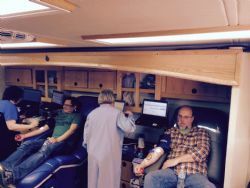 Our first council blood drive in recent history was a great success! 16 people came out to donate, and our drive was credited with 14 units of life-saving blood. Thanks to all who came out and gave their time for this worthwhile cause. 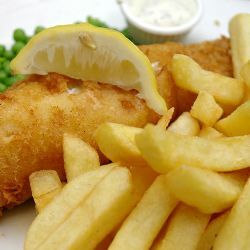 Thanks to all who came out and supported the Santa Maria Council 553 Fish Frys during this past Lent. Because of the team effort we were able to raise $284 for the Michiana Down Syndrome Family and Advocacy Support Group, $240 for the Forever Learning Institute, and net $1,883.20 for the works of our council. Thanks again! 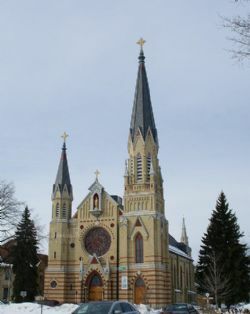 What better way to celebrate the Feast of St. Patrick than to have Mass Mob IV at St. Patrick Church in South Bend on Sunday, March 15, 2015. Once again Fr. Cyril was the celebrant, and he was very effusive in his praise for the Knights of Columbus in spearheading the Mass Mob movement. All enjoyed coffee and donuts afterwards in the school gym. CLICK HERE to see media coverage on WNDU.com. The Ignite Retreat at Marian High School is served Sunday morning breakfast by Santa Maria Council 553 Knights on March 8. Mike Amodei, Rick Becker, Jim Frye, Patrick Hess, Luke Reilander, Aaron Seng, Steve Sommers, Bela Szalay, Andrew Weiss and Frank Verteramo helped to serve 230 teens! Fr. Cyril Fernandes was very excited and enthusiastic in his praise for the Knights of Columbus in organizing Mass Mob III at St. Hedwig Church on February 21, 2015. The Saturday Vigil Mass wass well attended, and everyone present was invited to a free spaghetti dinner afterwards. Pictured in the front row (l-r) are winners Courtney Donndelinger, Samuel Thomas, Andrew Orians, Shannon Lanning, Rose Kavanaugh, and Ryan Goffinet. Back row: Master of Ceremonies Terry McFadden, Brother Eric Snyder, Mary Dornbos and Suzanne Wiwi. 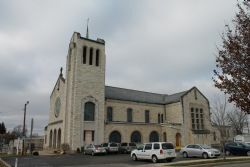 Once again the South Bend Mass Mob effectively doubled the numbers of a sparsly-attended Mass on January 11 at Our Lady of Hungary Parish. It was great to see many fellow Knights of Council 553, as well as others who related they had been following the Mass Mob through social media. 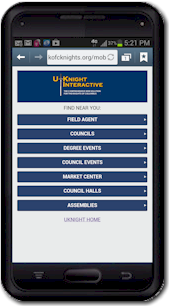 Brother Knights were also present from other councils, and many people spoke of planning to attend the next event. Fr. Kevin Bauman, also a 4th Degree Knight, spoke several times - before and after Mass -of the joy of welcoming so many people to his parish and his gratitude for the leadership of the Knights of Columbus. All enjoyed fellowship and refreshments afterwards, while taking in the beauty and history of this beloved church. Thanks again to Bart Timm for his many hours spent making this happen. From the files of one our deceased members we found a copy of the first 1925 edition of our council's newsletter, what would eventually become The Anchor. It's interesting to compare the past to the present.